Happy New Year to all with a wish for Peace at home and around the world. 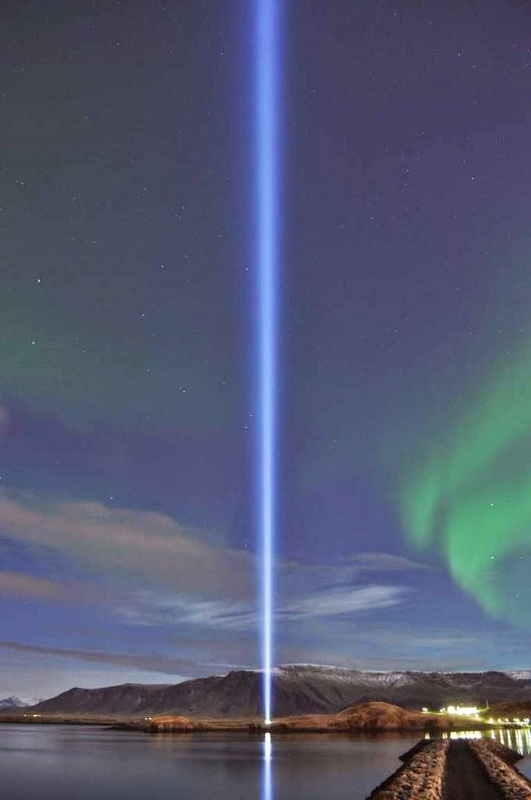 An inspiring message of peace is sent out by the Imagine Peace Tower in Rejkjavik, Iceland, a project by Yoko Ono. She created the peace tower in 2007, in memory of her husband, musician John Lennon of The Beatles. Have you read about this project? It beams a message of peace several times each year, including from the Winter Solstice through New Year's Eve. For a live shot on New Year's Eve, see the Rejkjavik EarthCam. 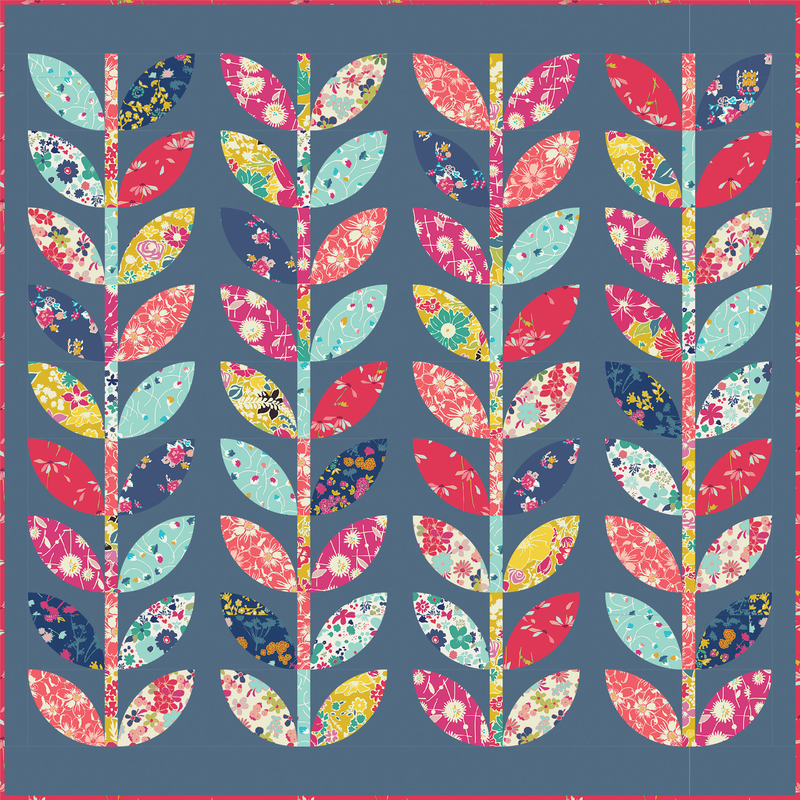 Here's a wonderful free pattern by Amy Butler Design to start off the month of January. 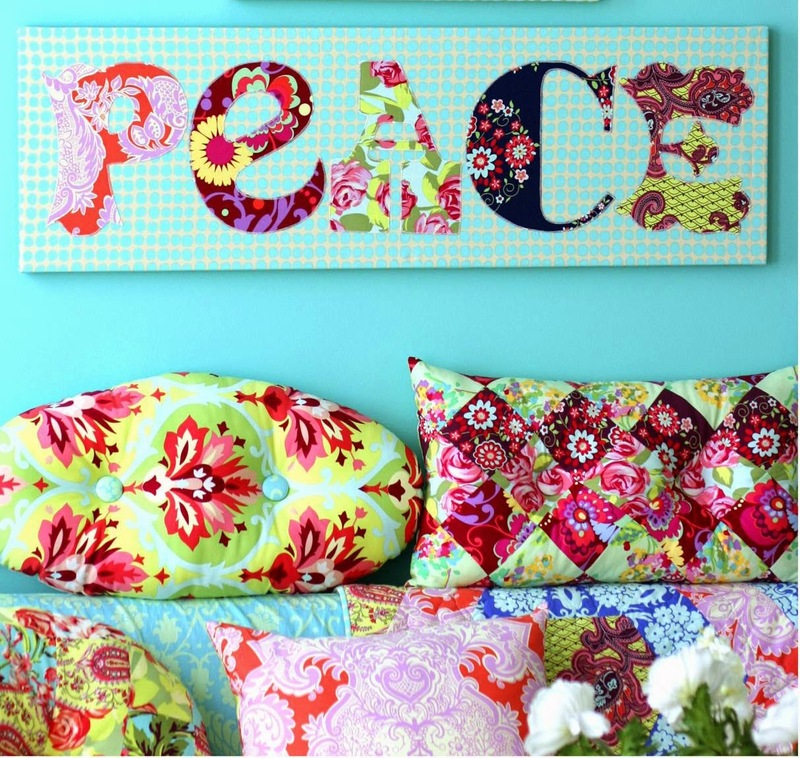 Use vibrantly colored prints to create a "Peace" wall hanging (and matching pillows!) Bring giant flowers inside to add an outdoors touch to any room. From California and Arizona U.S.A., Marina and Daryl wish all of you a very Happy New Year, filled with endless blessings of peace, happiness, and prosperity ! Merry Christmas to all! 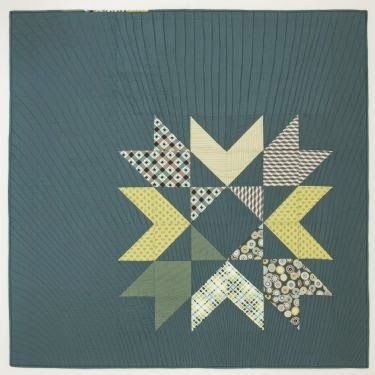 Here is a gorgeous quilt from our photo archive that reminds of the joys of childhood and Christmas. 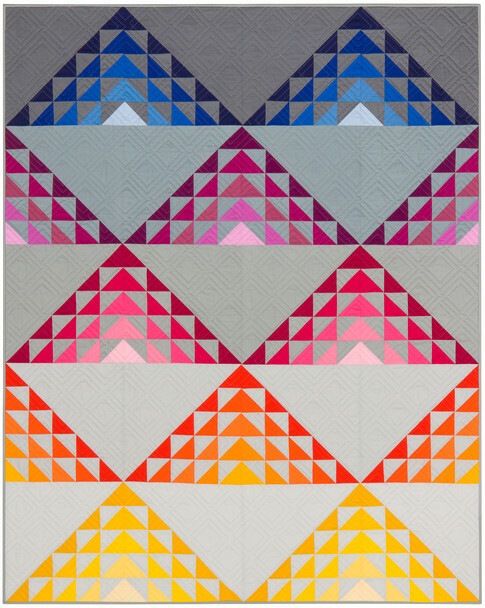 Third place winner for Best Quilt Made by Hand in the 2013 Houston International Quilt Festival, Ayako Kawakami says, "I have many experiences with my daughter's growing up, so I wanted to make a quilt with a lot of good memories." 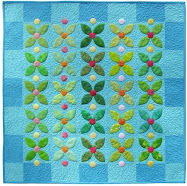 Each small quilt is overlaid with trees representing the season. In the photo below, hundreds of French knots were used to represent snow on the tall trees. The tiny houses at the top were whip-stitched with white thread to represent snow. Ayako Kawakami previously won First Place in the 2011 AQS Quilt Contest in Paducah for her quilt titled Santa Claus Comes to Kirara's Hometown. She also won Second Place for Kirara's Walking Road in the Wood at the 2010 IQA contest. Very best wishes to our readers at this festive season! 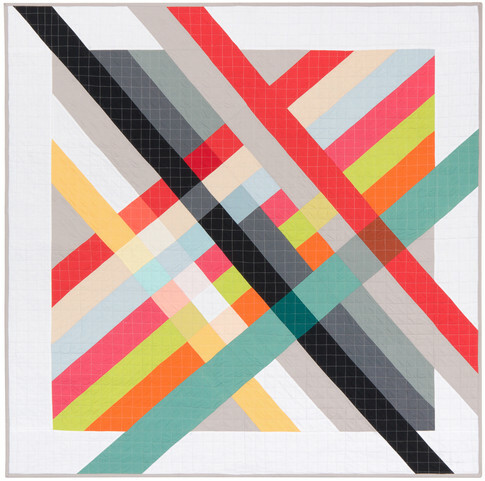 We'll be back to celebrate a New Year of Quilt Inspiration. Image credits: Photo were taken by Quilt Inspiration. 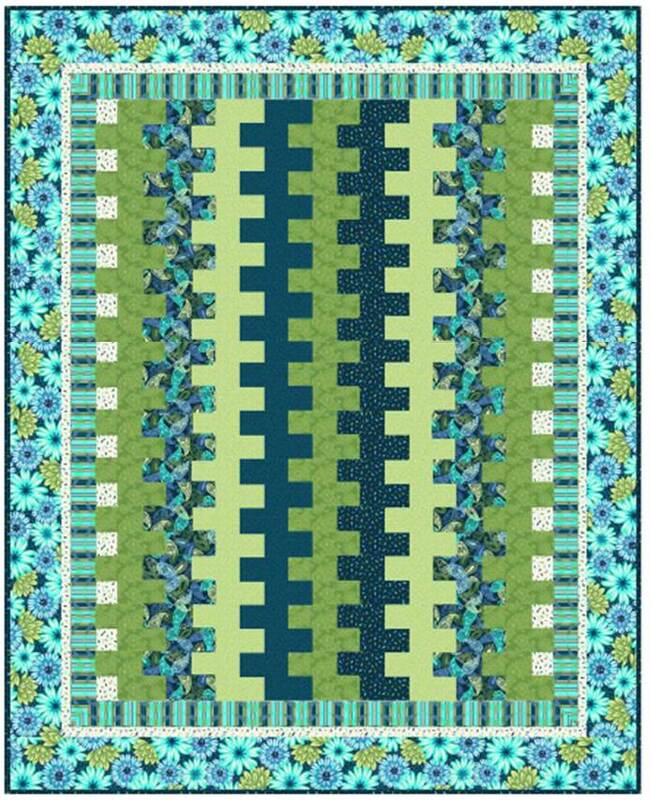 In searching for a quilt that would be meaningful to show for Christmas, we came up with this beautiful mini quilt by Vicki Bohnhoff. Knock And The Door Shall Open To You is the title of the quilt. For this original design, Vicki Bohnhoff says, "I combined the door image of a Mykonos, Greece chapel with a Byzantine-Christ mosaic of an unknown artist to convey the Bible verse Matthew 7:7." Vicki has created a scene of a remote village with a small church whose single bell tolls out the message of the New Testament. Her lovely quilting pattern gives a striking three-dimensional look to this work, as if you could almost imagine entering through the red door for a Christmas Eve candlelight worship service. 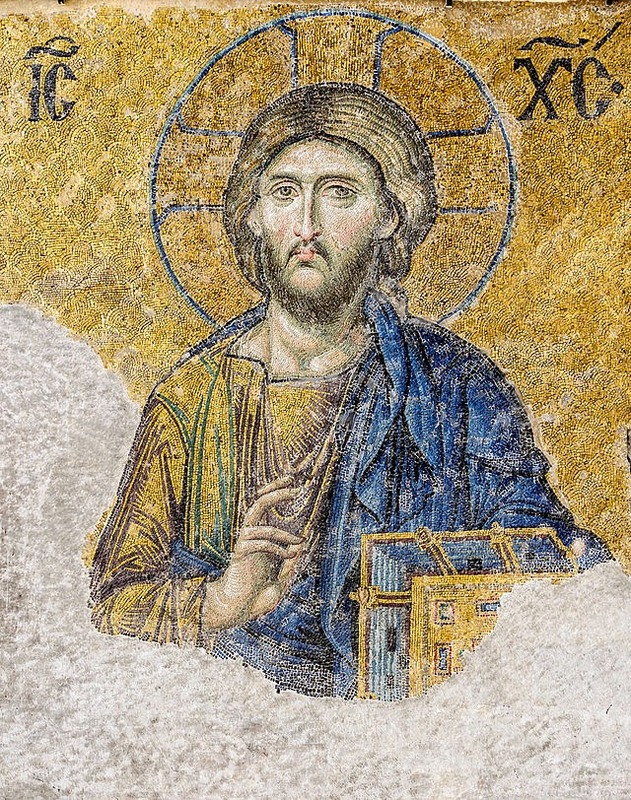 Above: The most famous of the Byzantine mosaics of the Hagia Sophia in Constantinople, made in the 12th century. As we celebrate the arrival of the Christ child and the arrival of new light into the world, we wish each of you and your families a very blessed and Merry Christmas. 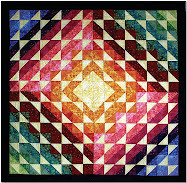 Image credit: The photo of the quilt was taken by Quilt Inspiration at the 2014 Arizona Quilters Guild show. 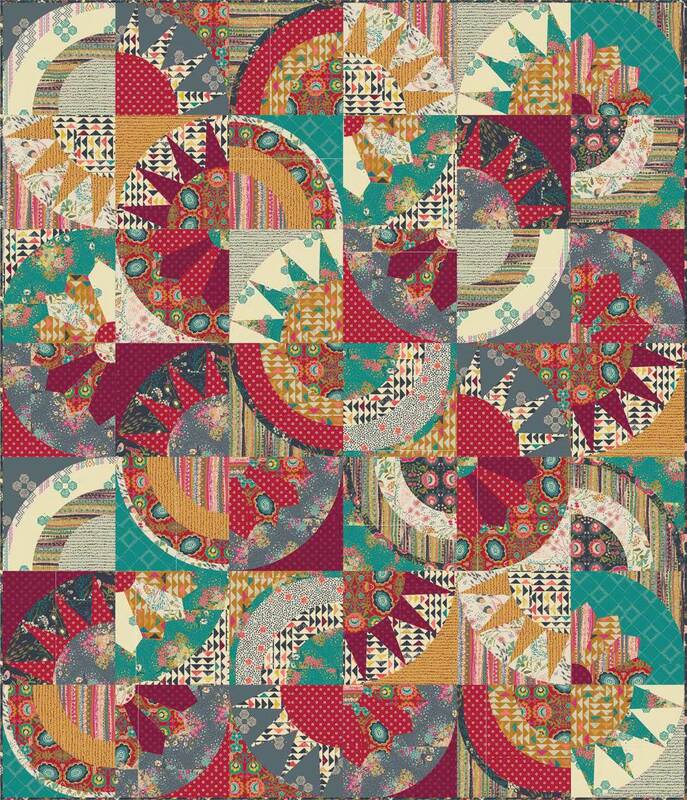 There's something about the December holidays and the art of quilting that goes together perfectly. Maybe it's the opportunity to share our creative talents and ideas with others in the spirit of the season. 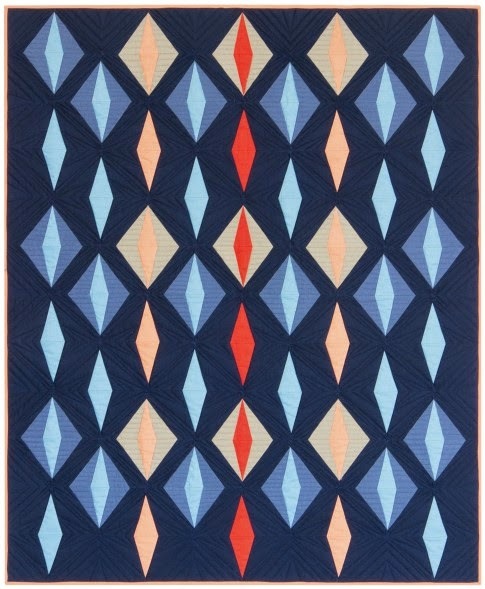 In that spirit, we're showing a very festive collection of quilts each week until Christmas. Here is Part 3 ! Cathleen Anderson says, "I used The Whole Nine Yards in various techniques of embellishing... 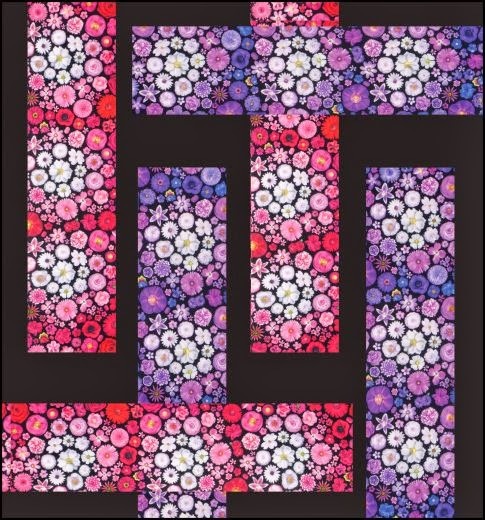 I put my own twist to this pattern and had great fun with the quilting." 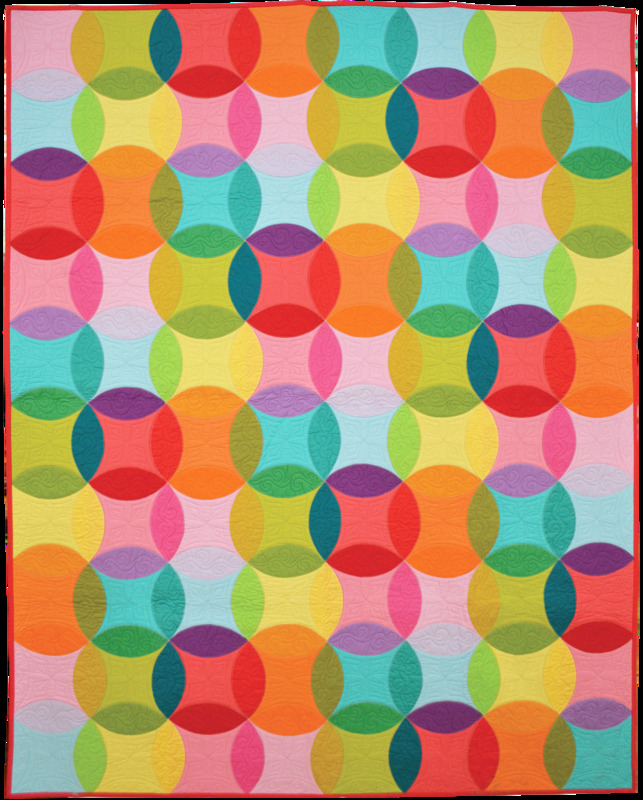 This quilt is based on a pattern by Melinda Bula in the book Candy Cane Lane: Quilts and More to Sweeten the Holidays (That Patchwork Place). 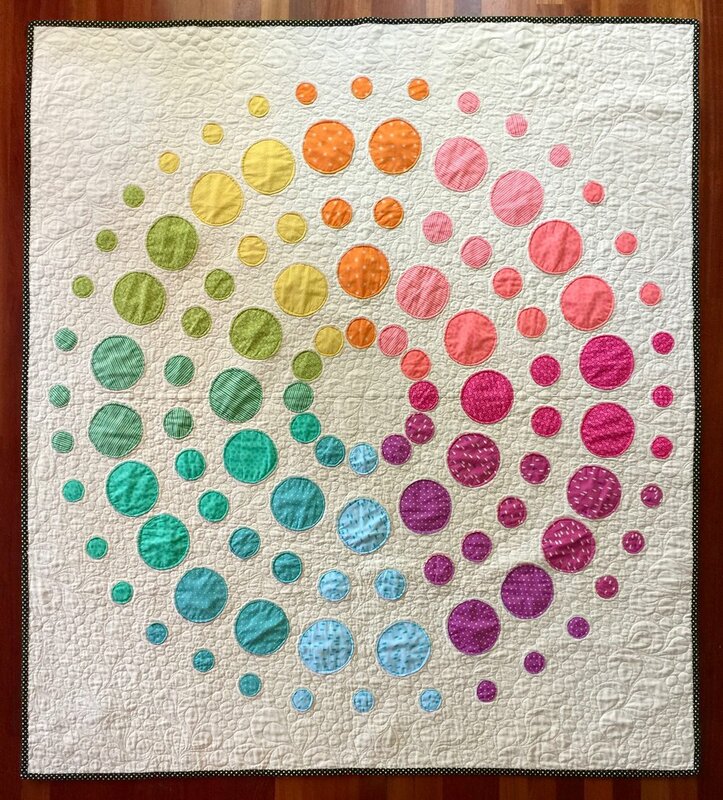 Cathleen Anderson made this fantastic quilt with hand and machine applique, paper piecing, chenille, couching, yo-yos, hand beading, fixed crystals, 3D application and machine embroidery. We loved the MERRY CHRISTMAS greeting spelled out in fabric tags. 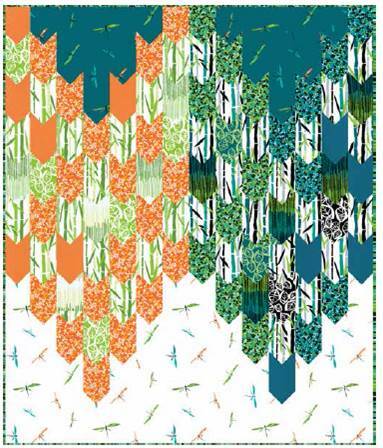 Marilyn McGinnis says, "These stately firs reflect the beauty of batik fabrics. What a great way to use my scraps and attempt beading for the first time!" The beading, which is not visible in this photo, was done along the edges of several of the miniature trees. 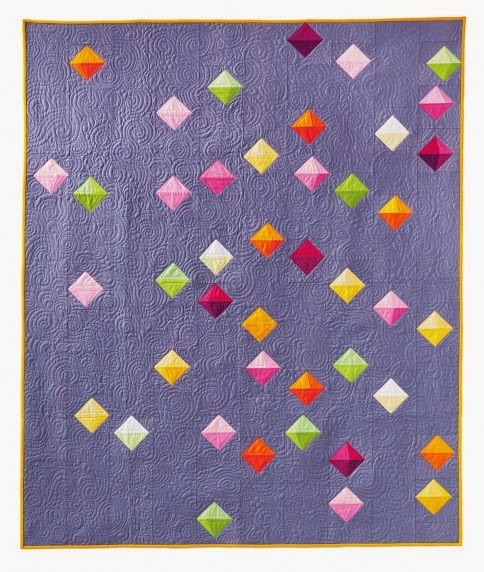 The quilt was inspired by the Jeweled Forest pattern by Renee Peterson. This quilt really puts us in the Christmas spirit! 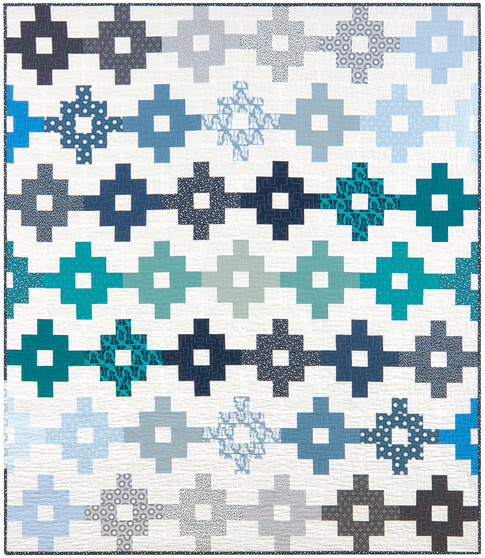 Kellie Willey won a blue ribbon in the Pieced-Medium category for her adaptation of the First Snow quilt pattern by Tina Curran. Kellie says "I reduced the pattern to 65% and rearranged the blocks. It was fun picking through my Christmas stash and adding decorations to the trees." We loved seeing all the cute beads and fussy cut blocks in the tiny houses. In the red house above you can see gingerbread men in the windows and on the rooftop. The green house has a candy cane roof with rick rack trim; a snowman, mouse and cat are peering out of the windows. Felicia Brenoe says, "I love the idea of loving and protective angels all around us. 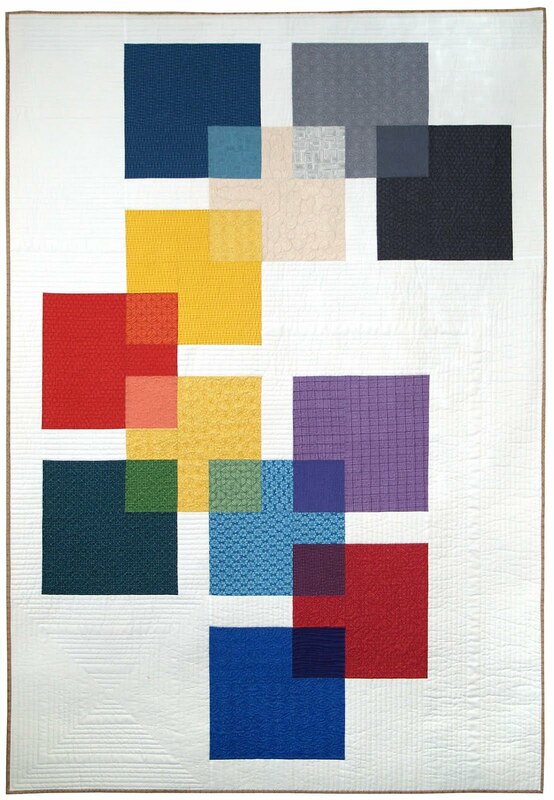 [This quilt is] hand appliqued and embroidered, and longarm quilted." 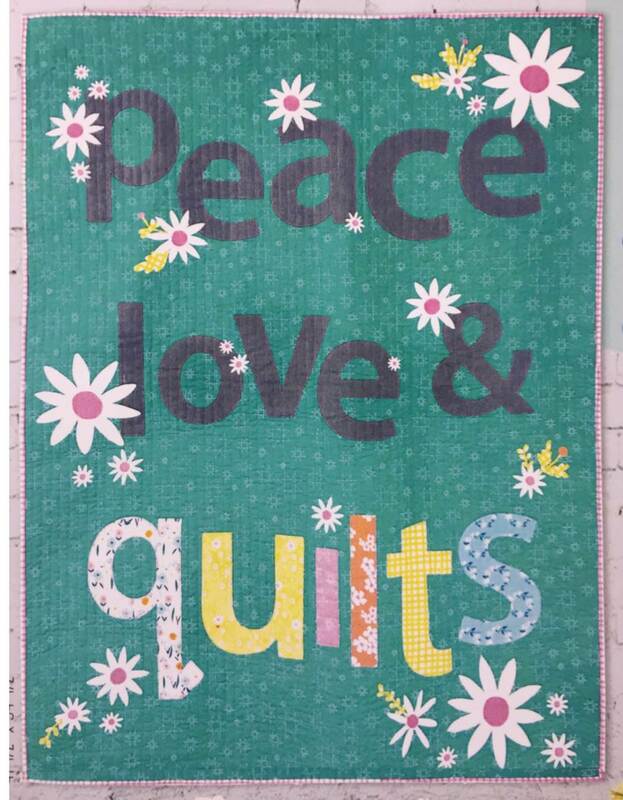 Peace, Joy, Hope, and Love are appliqued on the quilt. In this block an angel places a golden star atop the Christmas tree as children, holding hands, look on. 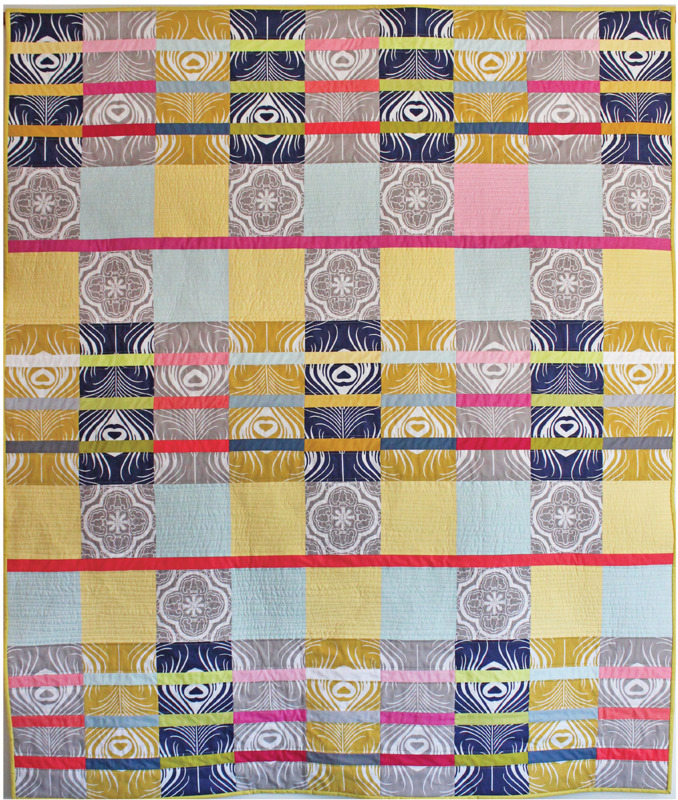 Felicia Brenoe's lovely feather quilting can be seen throughout the design. For some close up photos of the angels, see Felicia's website at Felicia's World. 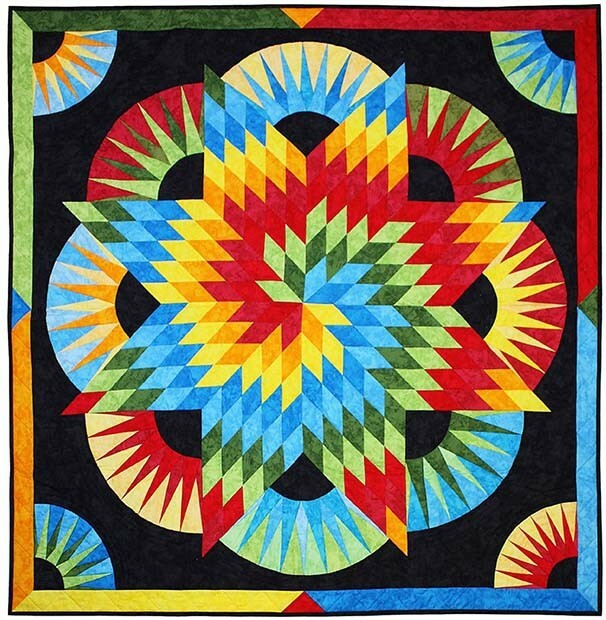 This stunning quilt won First Place in the Applique-Large category, and Exemplary Machine Quilting - Track Mounted, at the 2014 Arizona Quilters Guild show. Sue Maitre says, "Being a Santa collector, I knew Baltimore Christmas had to be a part of my collection." 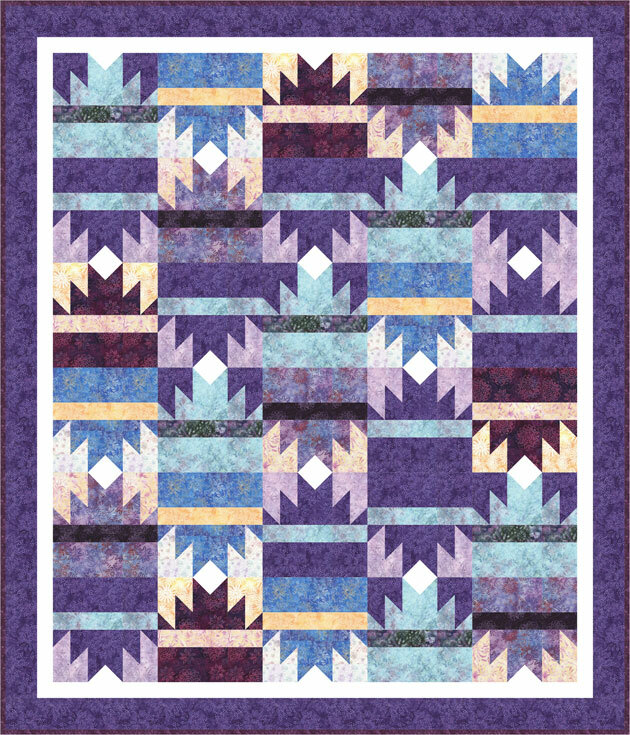 The Baltimore Christmas pattern is, of course, by Pearl P. Pereira at P3 Designs. We enjoyed the outstanding applique and quilting by Sue Maitre and quilting by Linda Hrcka, respectively. Check out the feather quilting coming out of Santa's pipe: it is done in charcoal thread to represent smoke. And what would Christmas be, without a Partridge in a Pear Tree? This year, the beginning of Hanukkah gives us an opportunity to feature a truly multicultural craft form. We first came across African Folklore Embroidery when we spotted this intriguing Judaic African Collage at a 2014 quilt show. 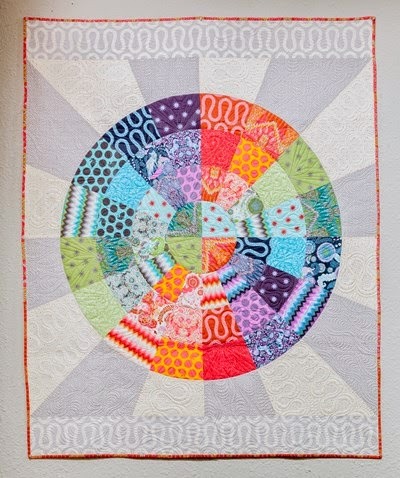 The designs and quilt are by artist Leora Raikin, who was born in South Africa and has lived in California for more than 15 years; she was taught this creative needlecraft by her mother. The blocks, which contain many Judaic designs, are embellished with strips of woven bead work, additional embroidery, and gold buttons. We learned that Leora Raikin is not only the artist but also the owner of African Folklore Embroidery, a rapidly growing business offering patterns and supplies for African Folklore, animals, birds, flowers, Judaica, and more. At yet another quilt show, we spotted a quilt that features six beautiful African Folklore Embroidery flower designs. The African Folklore Panels were hand embroidered by Christine McCollum, who used only two types of stitches: chain stitch and French knots. 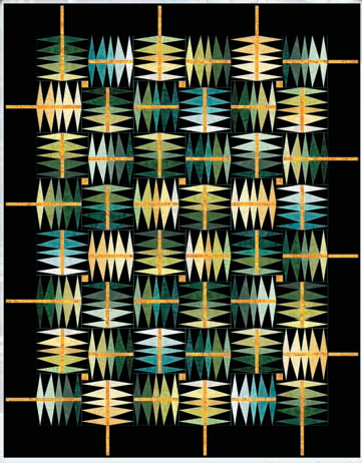 A collection of light and dark batiks join and frame the blocks in a braid pattern [Braid in a Day by Eleanor Burns.] 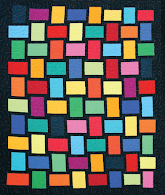 This quilt was exhibited at the 2014 Tucson Quilters' Guild show. You can see Christine's beautiful embroidery in the closeup photos below. The extreme contrasts of brightly colored threads against the black fabric make these flowers both striking and beautiful. Coming up: The January 2015 Road to California quilt show will feature the largest exhibit of African Folklore Embroidery that the state of California has ever seen. For more information on the show and on Leora Raikin's workshops and patterns, see the African Folklore Embroidery website. There's something about the December holidays and the art of quilting that goes together perfectly. Maybe it's the opportunity to share our creative talents and ideas with others in the spirit of the season. 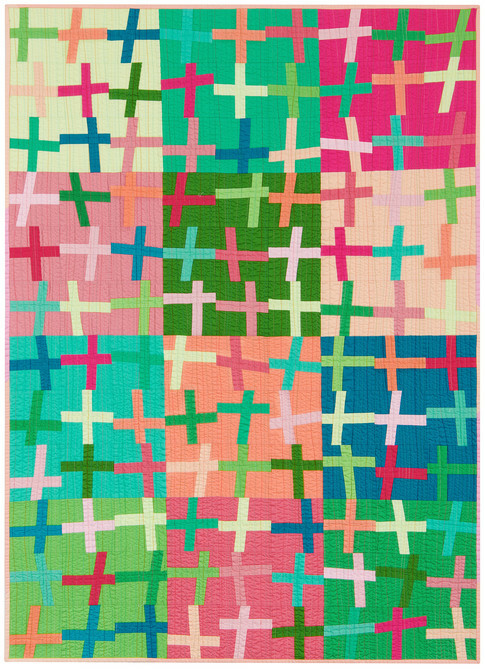 In that spirit, we're showing a very festive collection of quilts each week until Christmas. Here is Part 2 ! 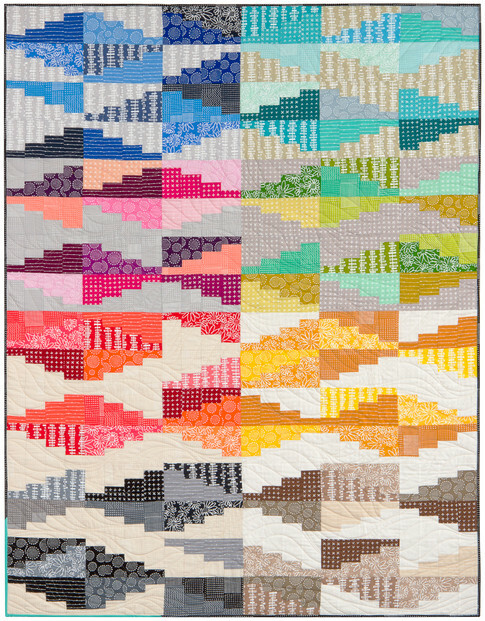 This quilt won the $1500.00 Directors Choice AND Viewer's Choice prizes at the 2014 Road to California Quilt Show. 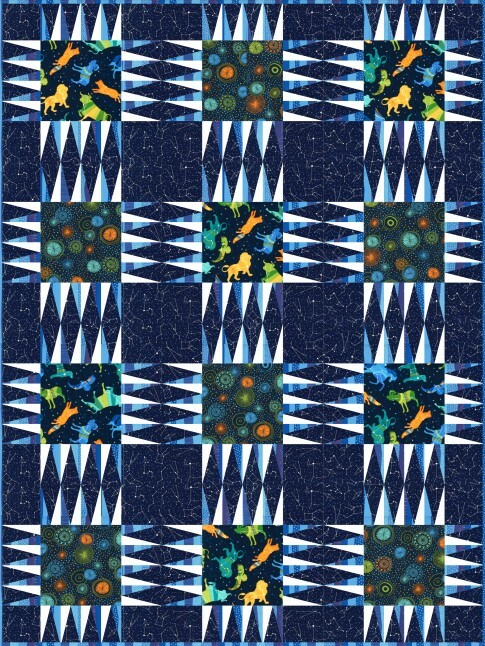 Kathy McNeil says, " [This quilt was inspired by] memories of a family Christmas sleigh ride. I really wanted to make the snow look like a watercolor painting done with fabric." Kathy McNeil's work is wonderfully lifelike, especially the textured coats on the horses and the snow-laden pines in the background. On her website, Kathy says: "I had so much fun designing the decorative and fancy harness and jingle bells." Can't you just hear those bells on the horses? 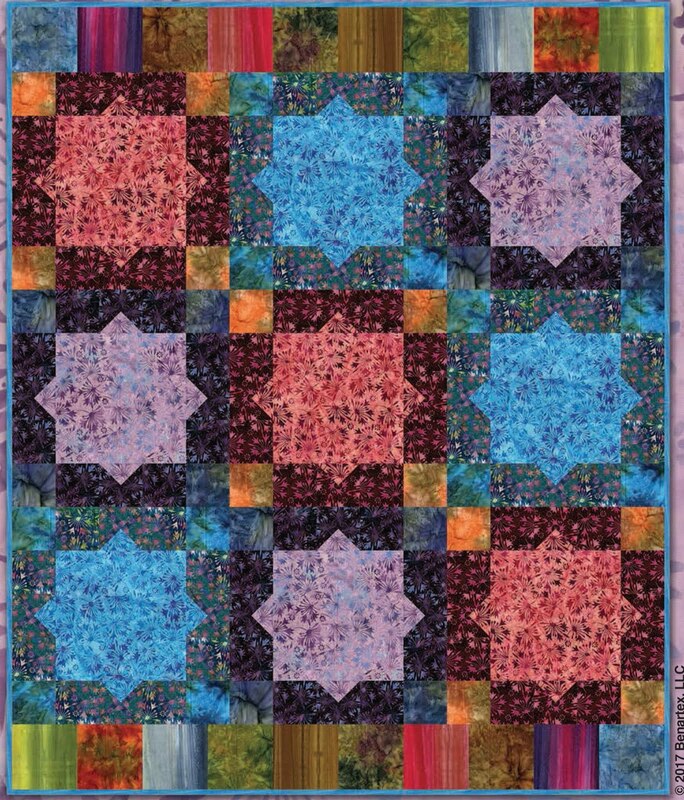 Nanette notes that this block was taken from a pattern by Darlene Christopherson called Nesting (it is out of print, but sometimes available on Ebay). The quilt was needle-turn appliqued and hand quilted. This applique motif reminds us of a beautiful, symmetrical Baltimore Album block, with its graceful curved leaves and stately redbirds. Here's a village enjoying Santa's arrival amidst the hushed serenity of a new snowfall. Linda Haltom writes, "This quilt is a depiction of Christmas Eve in the 1800's, along with toys of the period." Look closely and you can see some of the sparkles on the reindeer's harness and the trees. A Long Night's Journey took over a year to make; you can see the story here and a close-up photo below. On the left, you can see the vintage doll peeking out of Santa's bag. The thread painting on his beard as well as the snowy background gives this wintry scene an excellent texture. 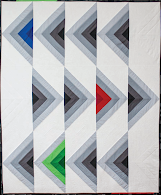 Char states, "This quilt was machine pieced, appliqued, and quilted. 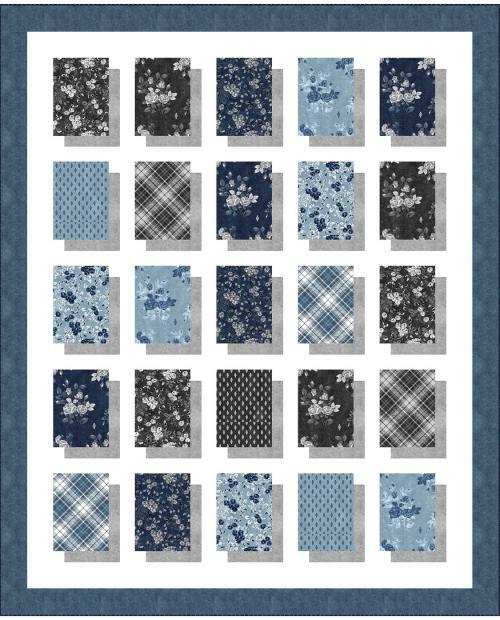 The pattern is Christmas Heart Lights - A Collection of Quilts book by Susie M. Robbins. Forty-seven hearts and forty-two berries adorn the quilt." 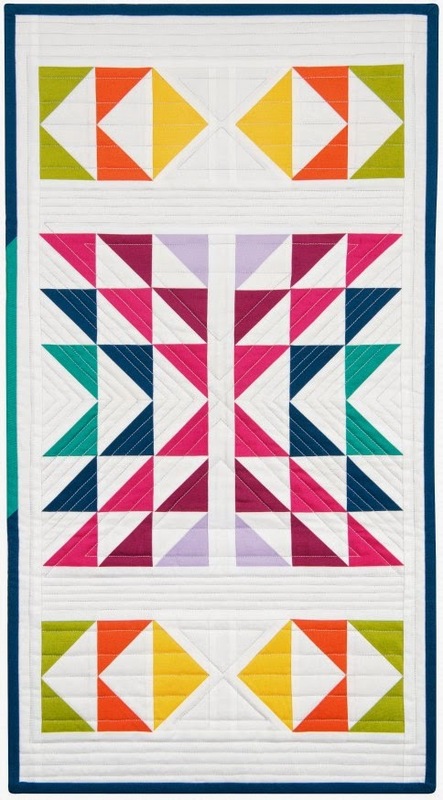 The pinwheels in the background and the pretty half square triangle border on the top and bottom give this quilt a festive, cheery appearance. 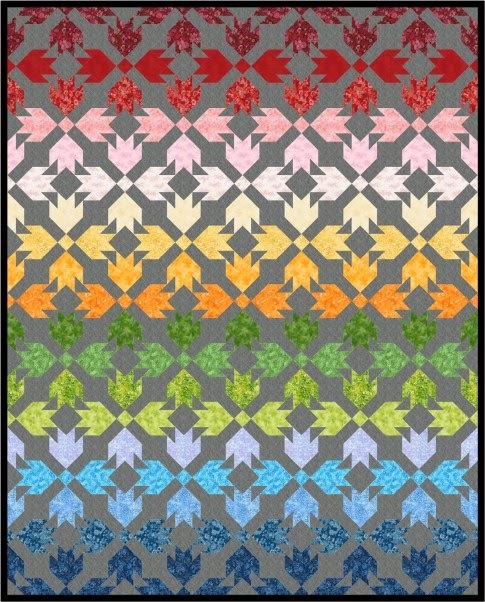 Kris Lovetro explains, "I pieced the red bird center from a gift [of a pattern; see below]. Tamara Morker, Maureen Pastika, and Brenda Dickinson added the interior borders. I finished it with the last border and branches." 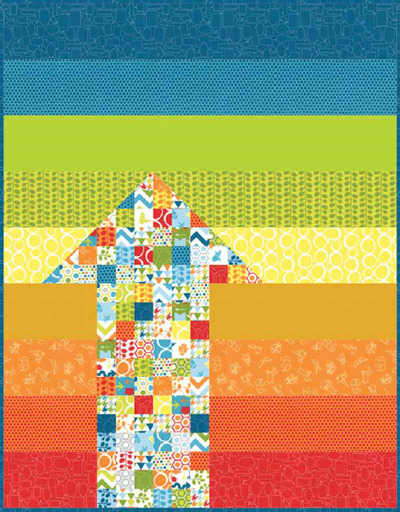 The borders were all designed and added by different quilters, but they coordinate beautifully together. 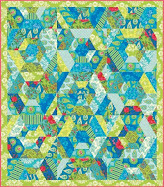 Kris' inspiration was the Winter's Majesty pattern by Cheryl Haynes, which was used as the center medallion. Here, you can see the lovely work she did to create a realistic, gently nuanced effect for the branches, needles, and pine cones. 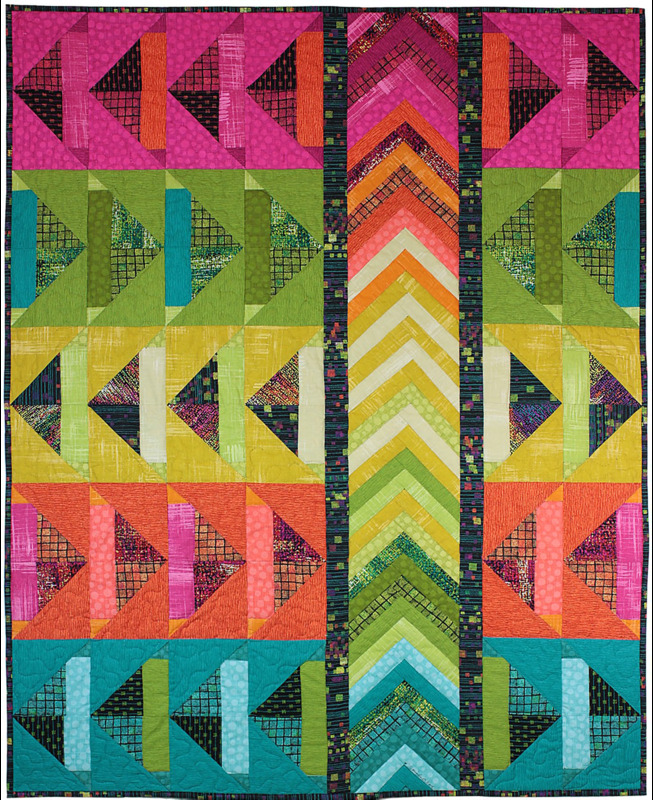 Happy (quilted) Holidays - The Best of Christmas 2014! There's something about the December holidays and the art of quilting which goes together perfectly. Maybe it's the opportunity to share our creative talents and ideas with others in the spirit of the season. 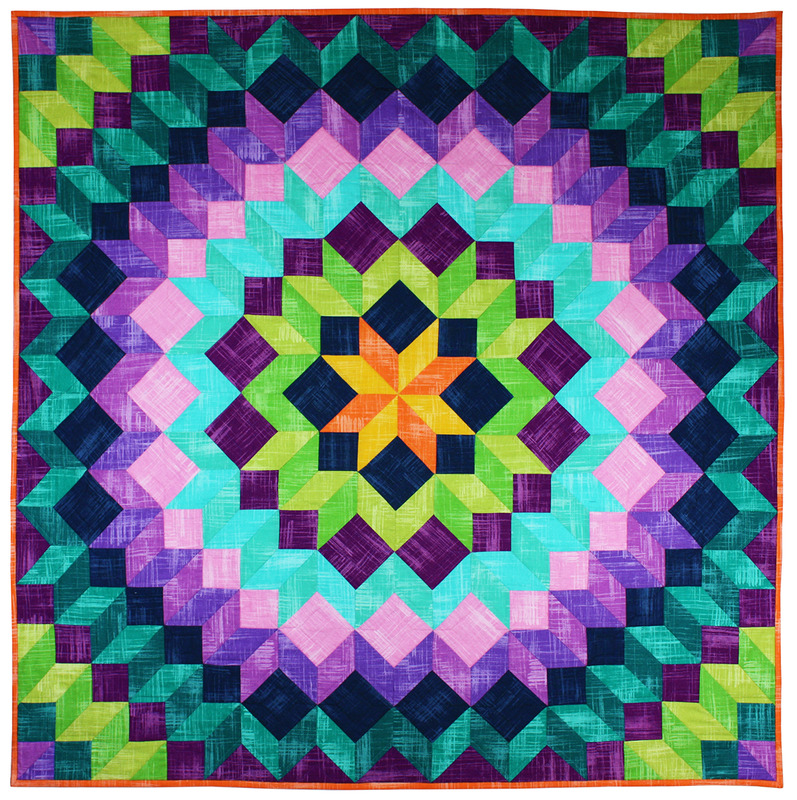 In that spirit, we're showing a very festive collection of quilts each week until Christmas. We discovered these quilts at the various shows we've attended in the past year. Enjoy ! 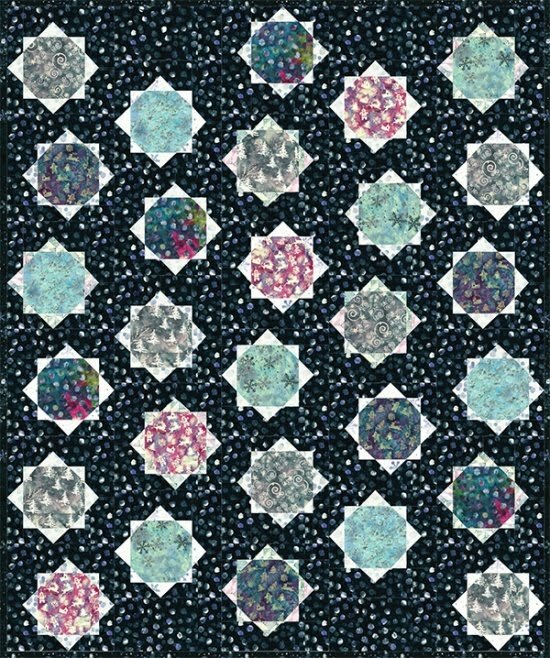 From the 2014 American Quilters Society show in Phoenix, Arizona, Jane writes, "December, in all its dark beauty, brightened by snowflakes and surprise bursts of blue sky, was [my] inspiration for this quilt." We loved the dazzling display of intricate snowflakes, reminding us that no two of these marvels of nature are the same. 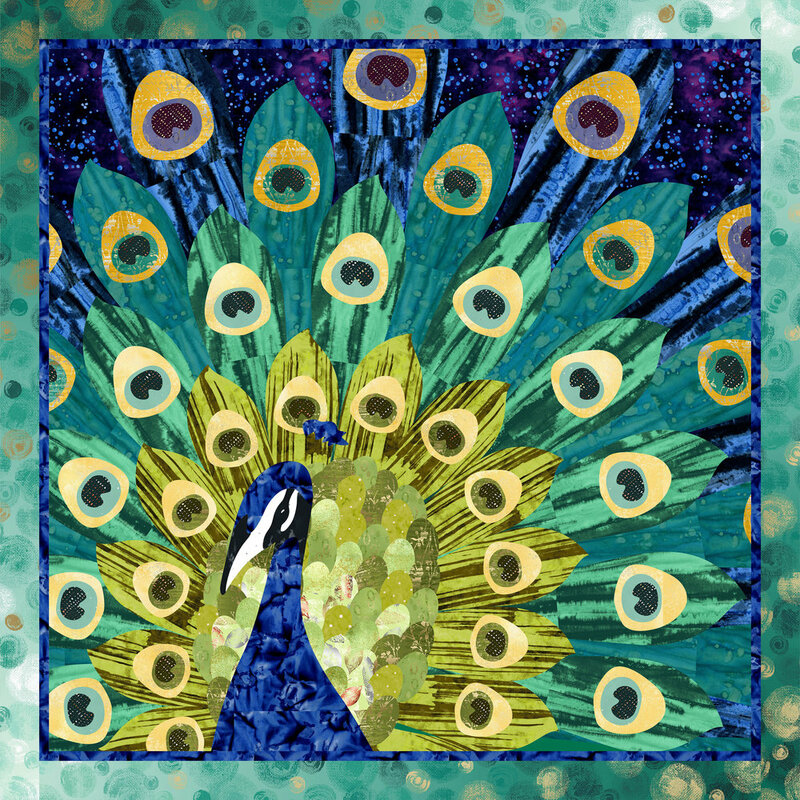 Jane adds, "I enjoy all aspects of applique and stitching, but machine applique is my favorite." Each of these lovely snowflakes is an original design from Jane. 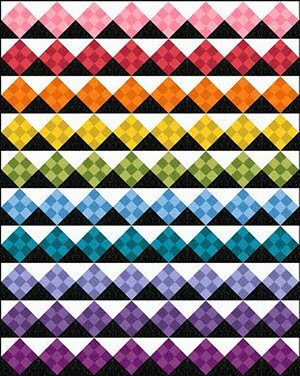 Isn't this a pretty quilting pattern? 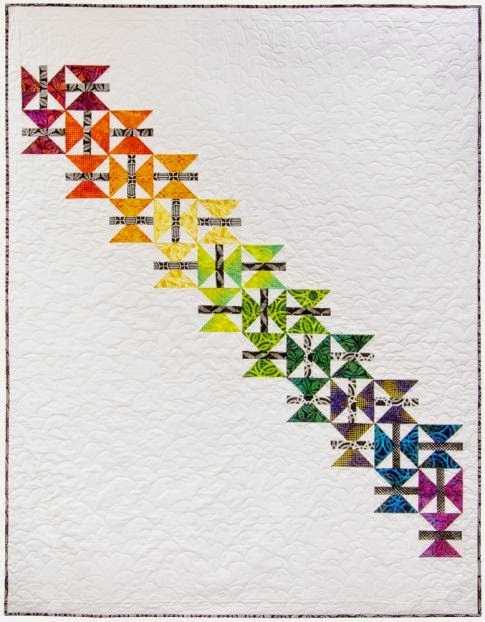 Jane notes that after drawing her own feather design for the open spaces in the quilt's borders, she quilted it herself on her home Bernina machine. 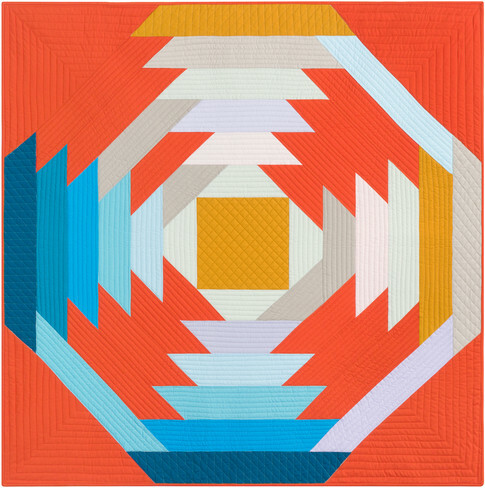 At the 2014 Arizona Quilters' Guild Show, Felicia notes, "[A] cozy holiday atmosphere inspired this quilt." Felicia's charming quilt is machine appliqued and pieced, with hand embroidery on the circular gingerbread men which comprise the wreaths. The gingerbread men happily dancing around the valentine hearts reminds of the cut-out strands of paper dolls that we played with as children. The Gingerbread Wreath pattern is by A Couple of Sisters Designs. 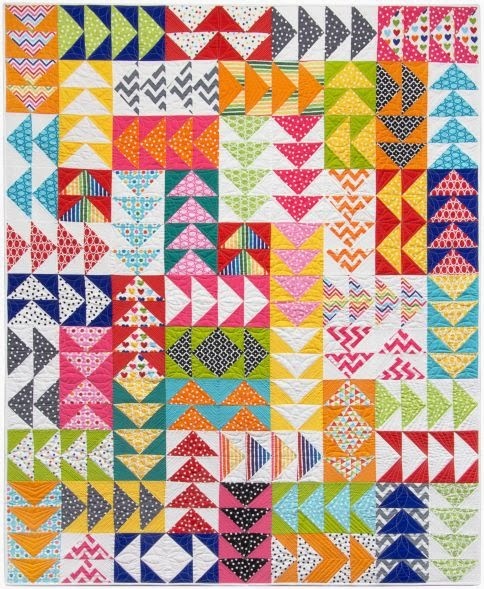 A ribbon winner in the category of Medium Size Quilts-Various Techniques at the 2014 River City Quilters' Guild Show, Linda notes, "All the blocks were embroidered individually on the embroidery machine. I love making Christmas quilts. This one is for my granddaughters." 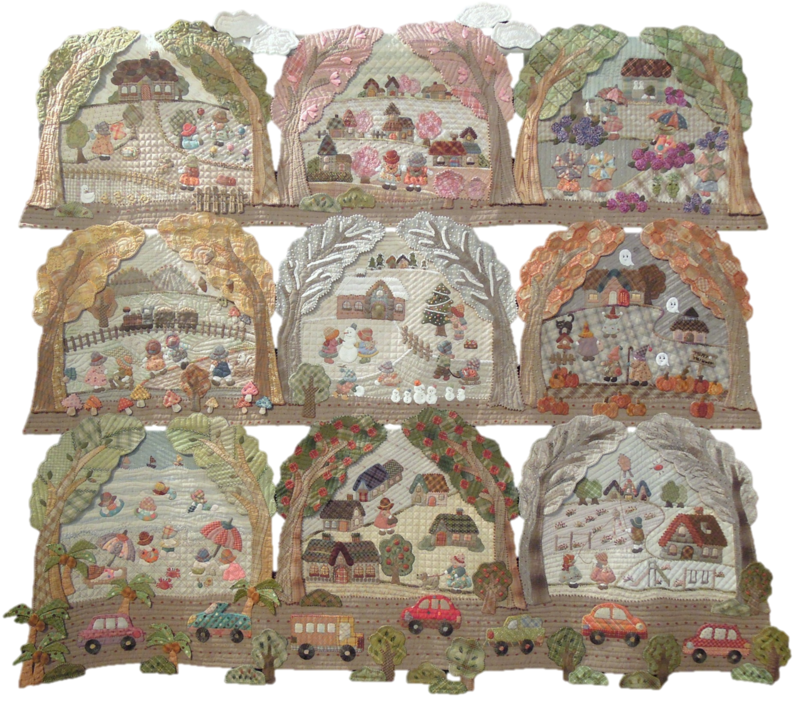 Linda has included an array of holiday motifs, including words, in her unique and colorful design. 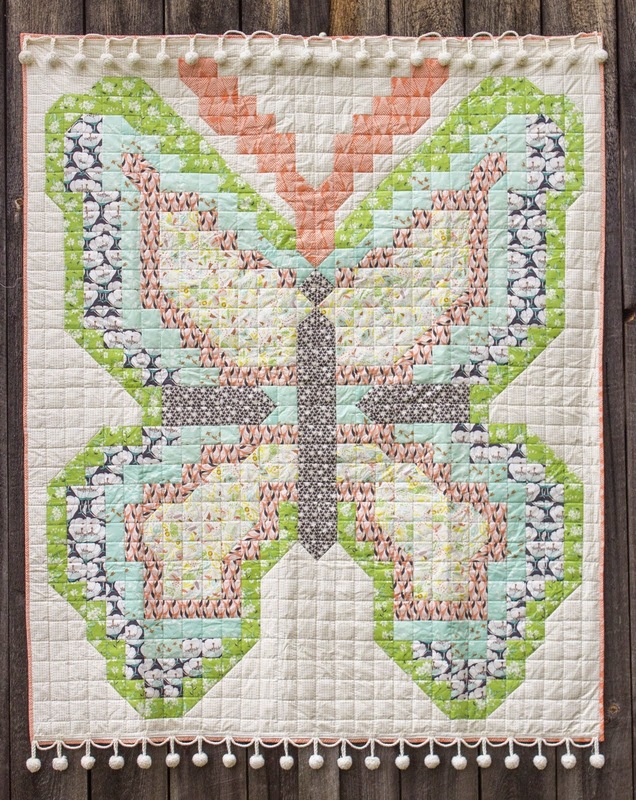 Richly textured fabrics and detailed embellishments give Linda's quilt a luxurious look. The shimmering embroidery threads add to the overall elegant effect here. Here's another Christmas quilt that caught our eye from this year's River City Quilters Guild Show. 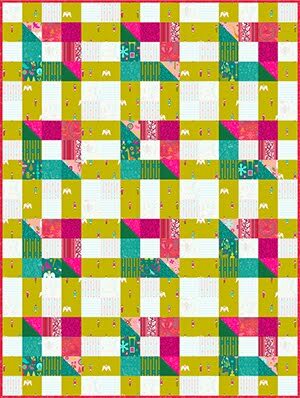 Alice notes, "My friend, Bev Maertz, made a quilt with this pattern, and I used it for inspiration for this new little Christmas quilt." 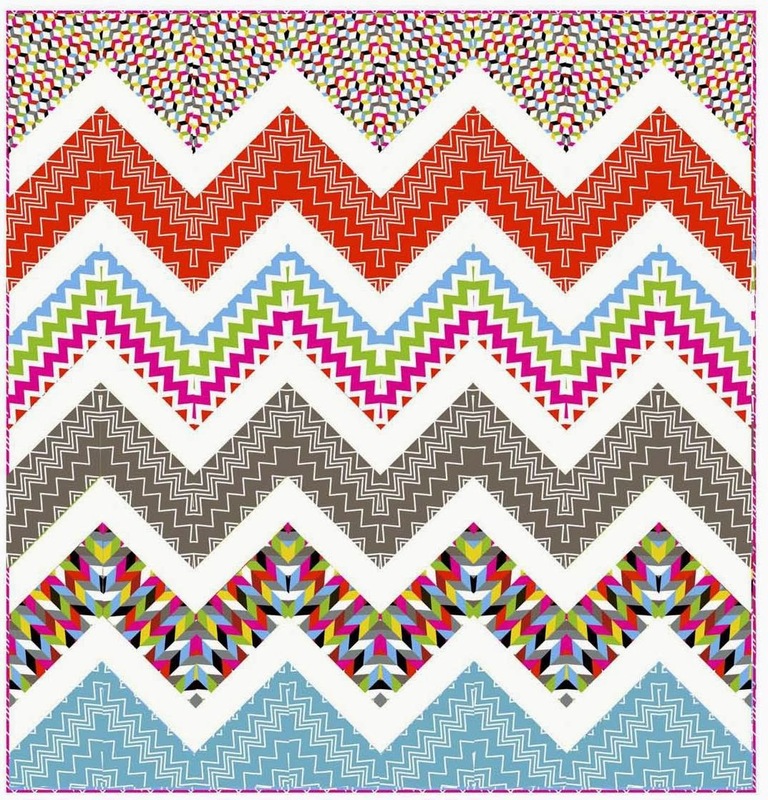 We love the candy-cane striped binding which gives extra sparkle and personality to this traditional pattern. 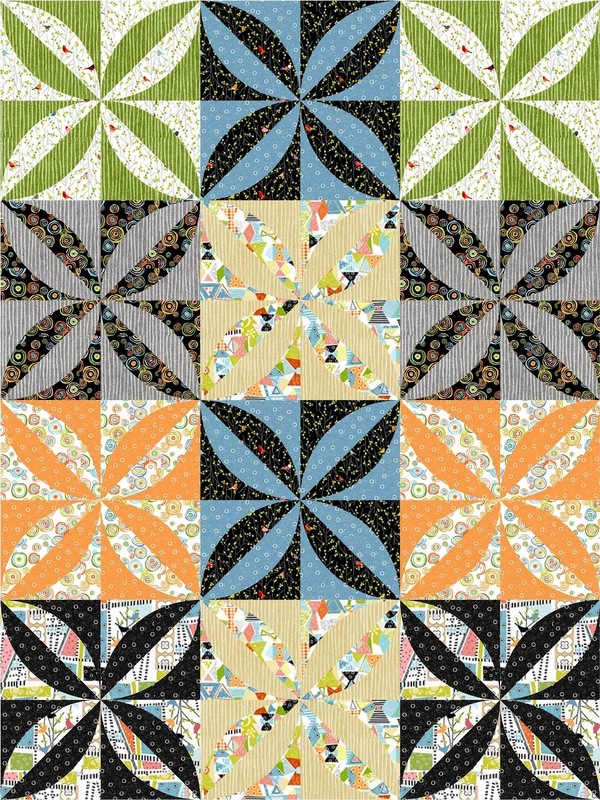 Alice has done an excellent job of selecting contrasting and pleasing fabrics which highlight the four- pointed friendship stars. All sorts of fun graphics were fussy-cut for the center of these blocks. 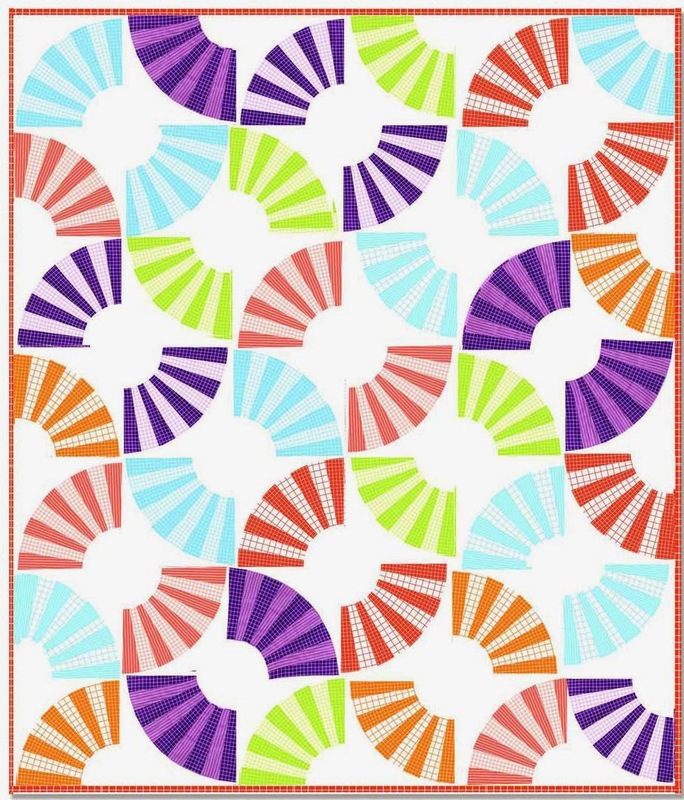 The graceful spiral quilting pattern is a nice complement to the angular blocks. We admired Alice's accurate workmanship in getting all the corners of the half-square and quarter-square triangles to match ! Jan notes, "Two Red Poppies began in a class with Donna Greenwald. I think her method of building a flower really lends life to the piece!" 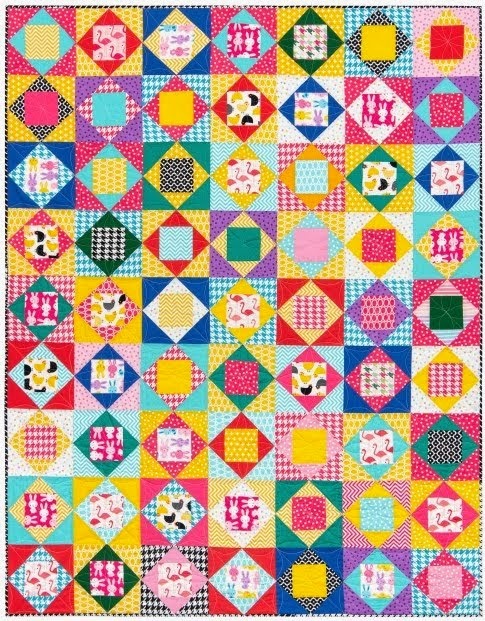 This cheerful quilt would brighten up even the darkest winter day. Pretty purple beads really add a glamorous three dimensional embellishment to the center of the poppies. Jan's use of split complementary colors gives a radiant quality to these eye-catching flowers. 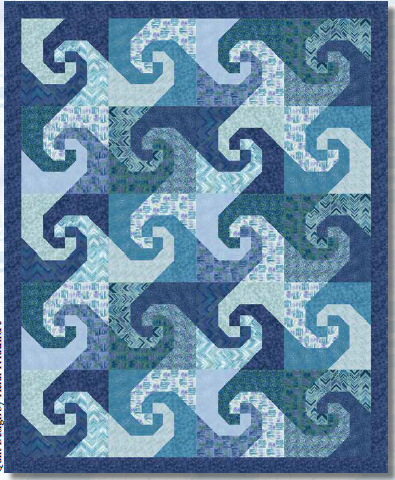 Second place winner in the Two Person Pieced Medium Size Quilts category, Linda writes, " This is a Judy Niemeyer design [Celtic Wave]; I thought the design that developed looked like a dragon. 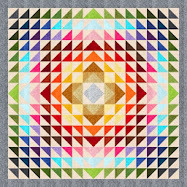 I enjoy paper piecing and find it relaxing." A background fabric of red-orange, gold, and smaller gray fans add to the vibrant Asian motif created by this intriguing design. 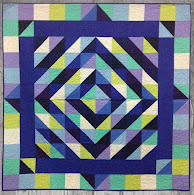 Chrissie is the blue ribbon winner in the Adult First Quilt category, which means that this as an adult quilter, this is her first creation. 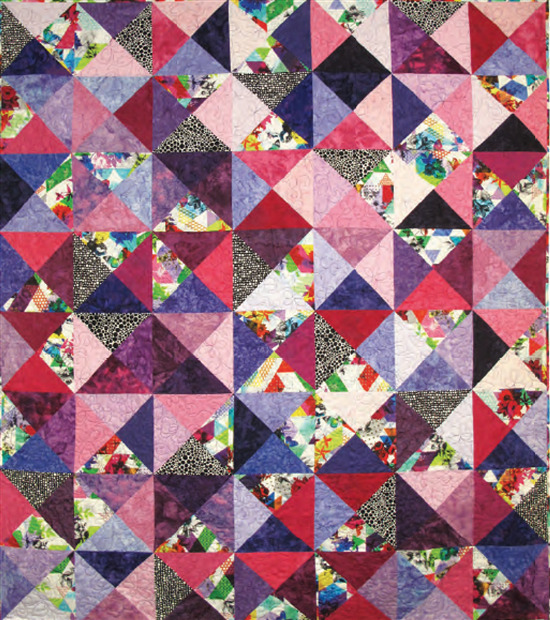 She writes, "I knew I wanted to learn quilting since I was in high school, but never found the right entry point. 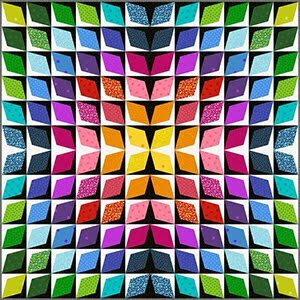 When I finally learned about a Kaleidoscope Quilt class for beginners taught by Carol Smith in 2010, I jumped at the chance." 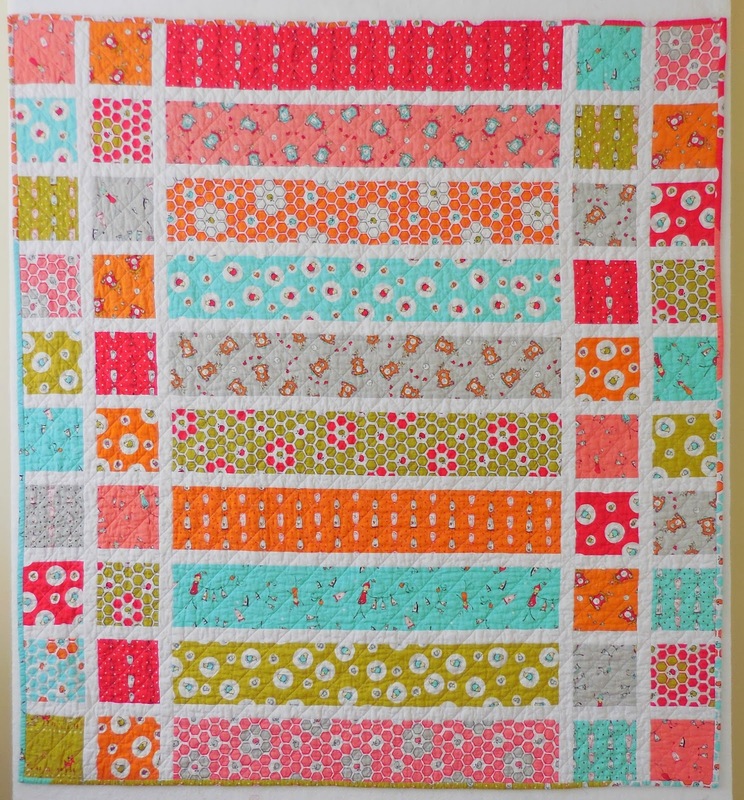 Chrissie adds, "This was my first finished quilt top, and I haven't stopped since!" 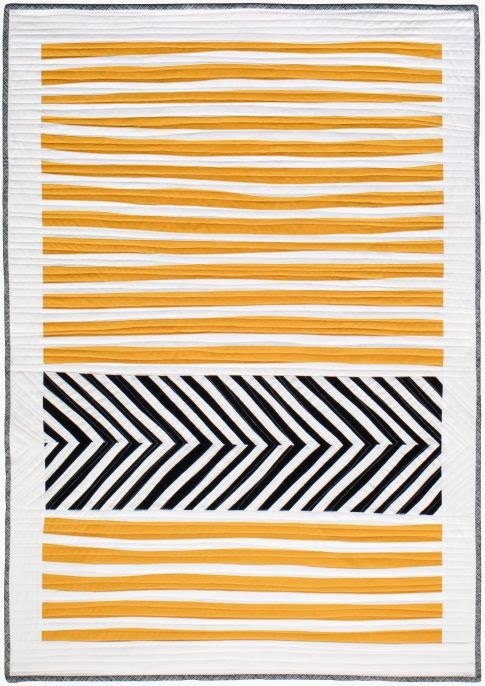 She quilted it herself, using a contemporary free-motion pattern which contrasts nicely with the bold geometric motif of the blocks. 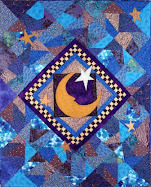 First place winner in the category of Medium Size Challenge Quilt, Diane writes, " Like the lanterns at a fiesta, these stars are festive and shine bright. They actually sparkle! 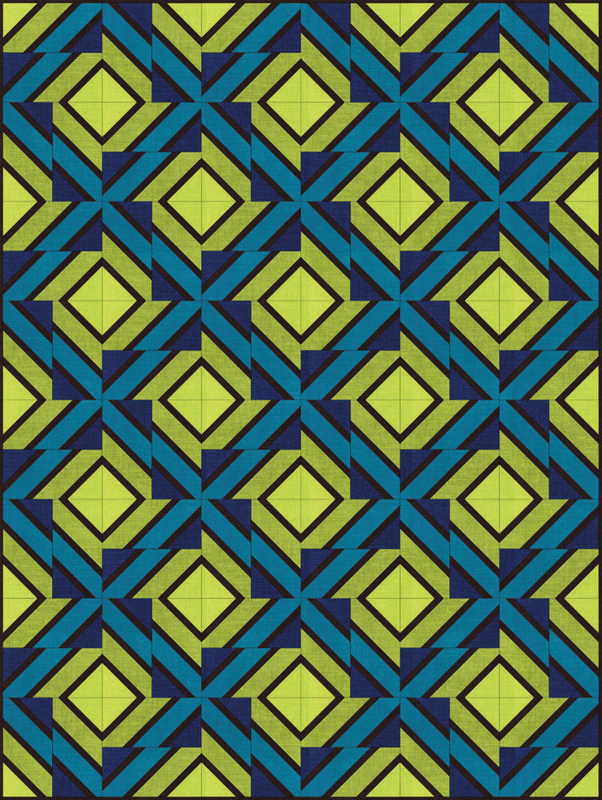 No two star blocks are quilted the same." 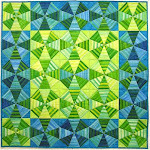 Diane has done a great job in constructing and quilting this dynamic pattern. 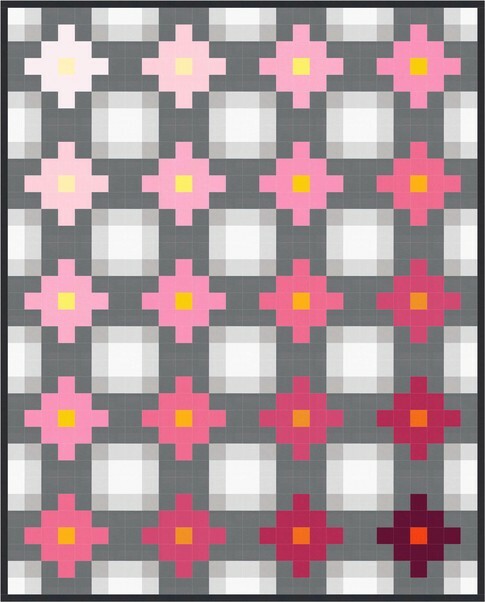 According to A Field Guide to Quilts, the basic block is "Texas Trellis". It's a variation of the Whirligig design, published by the Kansas City Star newspaper in 1936 and updated in 1943. 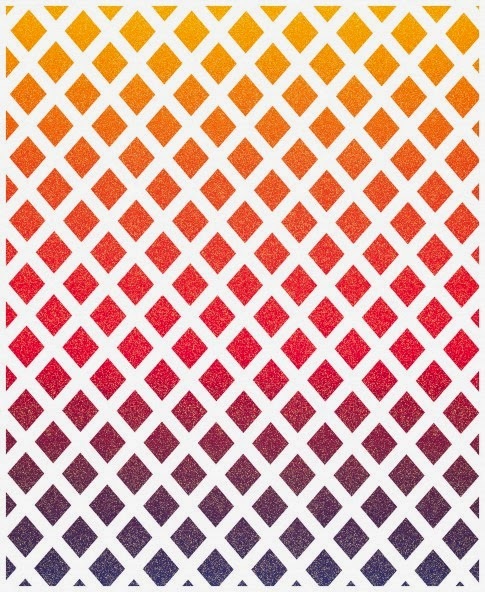 These blocks are six-sided hexagons, comprised of six triangles which fit together like slices of a pie. 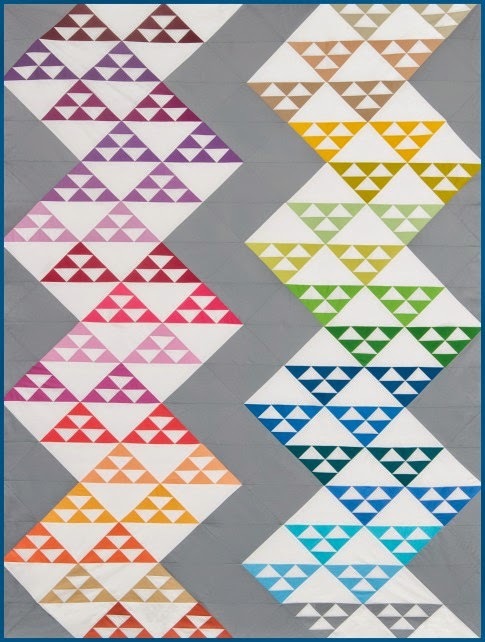 One side of each triangle is comprised of the deeper colored fabric, and the black fabric comprises the base of the triangle. 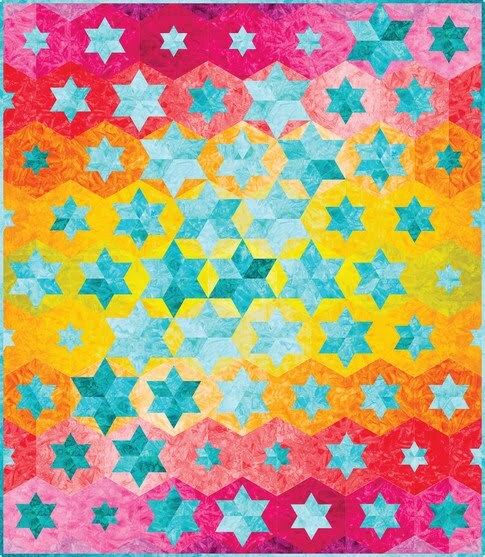 These blocks have an additional, lighter wedge that adds dimension to the stars. 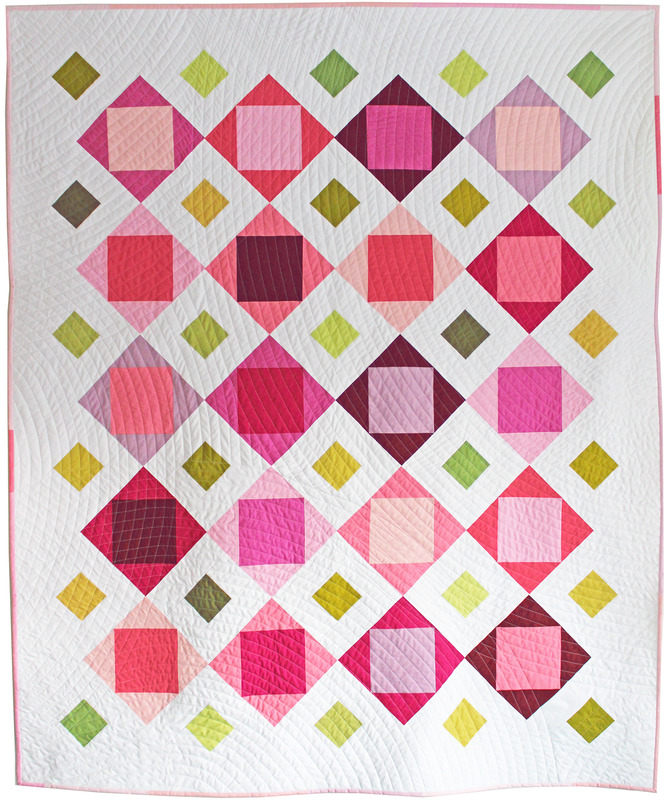 Note added on January 31, 2015: See the Bloom Bloom Pow quilt tutorial by Freshly Pieced Modern Quilts. Jaime says, "This is a Piece O' Cake design. It's mostly hand-quilted, except for the border." 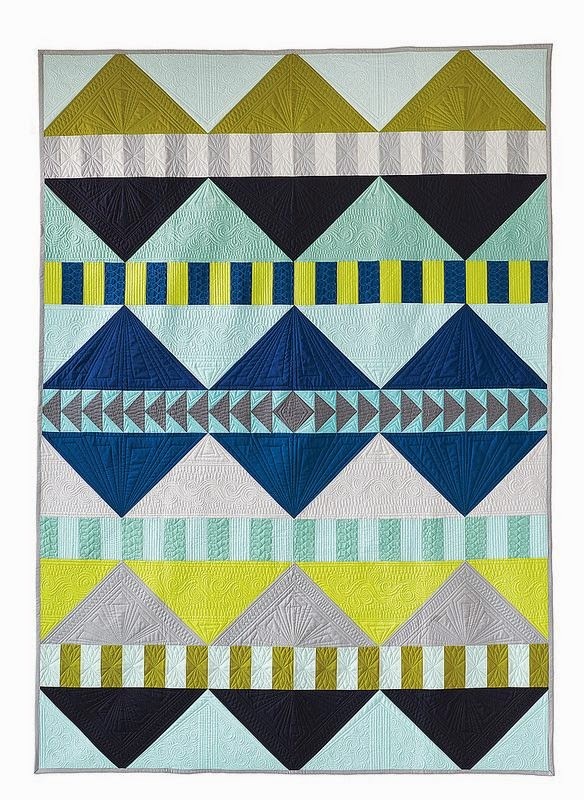 Jaime has used a variety of green fabrics for the twining inner border and lively striped fabric for the diamond, which provides visual interest energy to this large quilt. Extra charm is added by the two happy little blue birds at the bottom. A beautiful LeMoyne star center piece provides a striking focal point for this heartwarming traditional pattern. 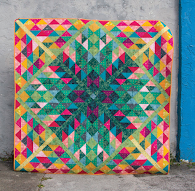 You can see Jaime Watson's precise hand quilting inside the pink star.